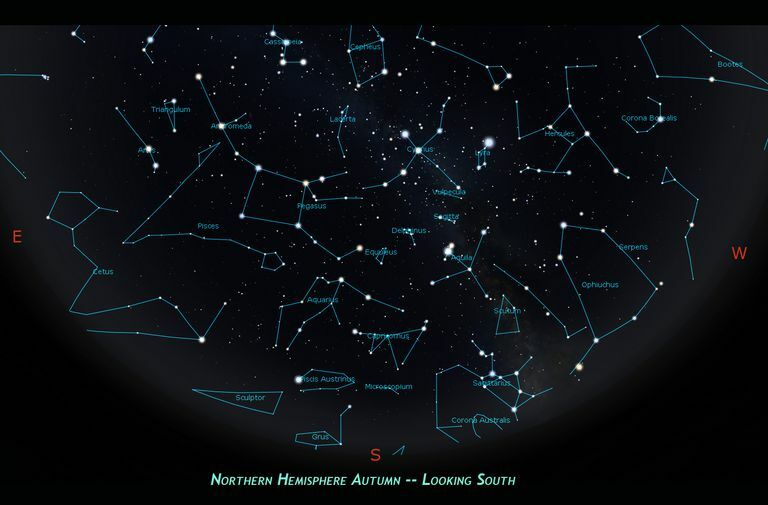 Northern hemisphere autumn skies, view to the south. The Aries constellation, one of the oldest-known star patterns, is located right next to the constellation Taurus. Discover how to find Aries and its fascinating deep-sky objects during your next sky-gazing session. Aries is most visible in the month of November. To find Aries, look for a crooked line of three bright stars not too far from the Pleiades star cluster. The stars of Aries lie along the zodiac, the path the Sun and planets appear to follow across the sky during the year. The name "Aries" is the Latin word for "ram." In the constellation Aries, two stars make up the points of a ram's horn. However, this constellation has had a wide range of different interpretations throughout history. The sky pattern was associated with a farmhand in ancient Babylon, a porpoise in the South Pacific, a pair of bureaucrats there in ancient China, and the god Amon-Ra in ancient Egypt. All of these outbursts of meteors are associated with the material left behind by comets as they make their way around the Sun. Earth's orbit intersects the comets' paths, and as a result they appear to flow from the constellation Aries. The three brightest stars of Aries constellation are officially called alpha, beta, and gamma Arietis. Their nicknames are Hamal, Sharatan, and Mesarthim, respectively. Hamal is an orange giant star and lies about 66 light-years from Earth. It's about 91 times brighter than our Sun and is around 3.5 billion years old. Sharatan is a fairly young star, slightly more massive than the Sun and about a third brighter than our star. It lies nearly 60 light-years away from us. It also has a companion star that is much dimmer and orbits at a distance that still hasn't been determined. Mesarthim is also a binary star and lies about 165 light-years away from the Sun. There other, fainter stars in Aries, too. For example, 53 Arietis is a runaway star that was violently ejected from the Orion Nebula (at the heart of the constellation Orion) in its youth. Astronomers suspect that a nearby supernova explosion sent this star on its way across space. Aries also has a few stars that are orbited by extrasolar planets. Aries contains several deep-sky objects that can be discovered through binoculars or a small telescope. Perhaps the most interesting is the spiral galaxy NGC 772, which lies south of Mesarthim, and its companion galaxy, NGC 770. Astronomers refer to NGC 772 as a "peculiar" galaxy because it appears to have some structures not always seen in regular spiral galaxies. It's a star-forming galaxy and lies about 130 million light-years away. It's very likely that its interesting shape (with one very bright blue arm prominently displayed) is due to an interaction with its companion. A few other very distant and dim galaxies are scattered throughout Aries, including NGC 821 and Segue 2, which is actually a companion galaxy to the Milky Way.